You are at:Home»Life Issues & Bioethics»Euthanasia & Assisted Suicide»Killing Them Softly? Sounds innocent enough. 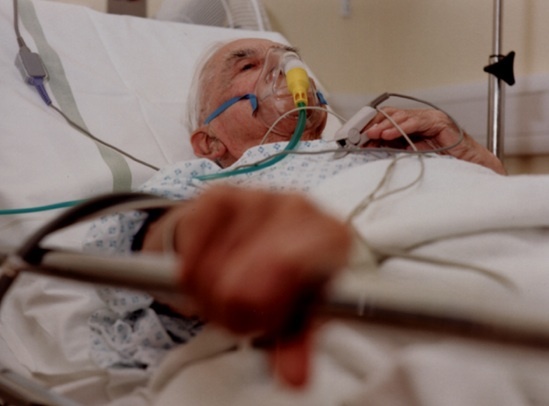 After all, when a person is terminally-ill or injured and there is no reasonable hope for recovery, the best the medical community can do is to make the patient as comfortable as possible, striving to provide an environment where the patient can die with dignity, surrounded by trusted doctors and cherished loved ones. There’s more to this story, however. The LCP is now under investigation by government officials after reports surfaced that the process is being implemented on sick and disabled newborn babies. Make no mistake about it, this is killing, not letting die. We treat our dogs better than this. It would be infinitely more humane to put a bullet in these babies’ heads, or to administer a lethal injection, but then that would bring into sharp focus the reality of what doctors and health care providers are doing to these infants. I can recall visiting the Holocaust museum in Washington, D.C., during the time of the Terry Schiavo controversy. An entire room was devoted to how the German medical community was complicit in the Fuhrer’s objective of eliminating the mentally and physically handicapped from the Aryan race. Of course, as we know, this objective was expanded to include Jews, gypsies, homosexuals, and any other group the government deemed unwanted or unworthy. Can it happen here in America? You bet. How can we resist it? Members of the health care community must rise up and insist that their role is to cure and not to kill. Members of the public must express their outrage and treat those who participate in these dastardly deeds as pariahs. Policymakers must insist on stopping the state-sanctioned elimination of those with “lives not worth living,” a phrase coined by the social engineers of the Third Reich. We must reclaim the sanctity of life ethic that is rooted in the notion that human beings are made in the image of God. We must rail against the notion that a human being’s “net worth” is calculated based on their instrumental use to society. In an era where we have embraced a radical view of the separation between Church and State, refusing to permit religious values to influence our public policies, it is little wonder that Big Brother is more and more becoming our persecutor rather than our protector. Unless something changes, we can be certain that once our utility is gone and our lives are deemed as not worthy of living, there will be no one there to speak on our behalf when the government decides to pull the plug. The current president, Barack Obama, is all for euthanasia. Witness the fact that as an Illinois state senator, he tried to decriminalize the murder of babies who survived abortion. Only a wishful thinker would believe that Obamacare does not institutionalize euthanasia.